It feels strange to me that while writing a short reflection on Harold Lavender I’m struggling to find the right words since Harold always seemed to have something to share whether it be a story or a reflection of some kind. So I’ll do my best to offer what I can for a person who gave so much time and energy to their lifelong work, to the neighbourhood which they so obviously loved, and to the many friends and comrades in their life. Harold and I worked together during my time with The Volcano Newspaper and Alliance Against Displacement. And when not writing, editing, or meeting as a group, Harold would always welcome, and often initiate, a conversation together over coffee. They offered a sense of comradery that developed outside of meetings in a way that offered more time for fuller discussions about our work together. These meetings offered a stronger sense of community as a place for our relationship to develop and talk through decisions or circumstances that we struggled with. And though we may not have always agreed, Harold was open to be challenged. They would listen to my many questions and clumsy theories with skilled patience, surely developed from decades of working alongside many people with varied experiences and struggles. On many occasions, Harold and I walked home together after meetings at the Carnegie, a walk I’m sure they made thousands of times. I’ll always remember Harold’s presence–arriving at meetings with a hat on top of their curly greyish white hair, often with their walking poles, one in each hand, their glasses sometimes resting on their nose, usually wearing a button down shirt with their coat on top, and always complete with a smile. Whenever I’d ask “How you doing Harold?” I’d always get a full answer as they never shied away from giving a complete update. 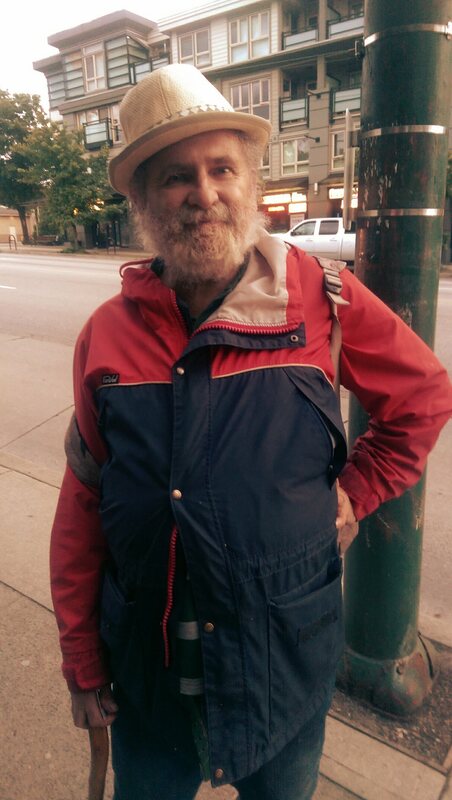 And whenever there would be community meetings in the Downtown Eastside about something important, they’d be there. Harold always made sure to show up. In their own reflections about the world, Harold included their personal experience into our discourses with a specific focus on their health and housing. In their later years of life, many friends and comrades of Harold supported them during their time in and out of hospital during their chemotherapy treatments and at other doctors appointments. Harold would regularly ask for visitors and also ask for people to read to them, a student until the end. They spoken openly about moments of anxiety and fear when they received disappointing news about their health. This act of vulnerable honesty is a lesson for us all as it welcomes us to be upfront about what we fear in our life and specifically our health with the people around us. A few years ago, The Volcano hosted a dinner fundraiser to help pay for our next print issue. We organized a few performances for the evening, mainly musicians and poets. And while we were thinking of other acts to include for the evening Harold rose to the occasion and volunteered to fill a time slot that evening performing stand-up comedy, something I wasn’t aware they’d ever done before. Their persistent energy to sustain the paper and encourage learning was evident. I have many memories of our long editing days together with The Volcano collective at the Carnegie when we would take turns copy editing the articles submitted for publication. Harold would take a great deal of time on each article as they were sure to comment on what they supported about the content or perhaps how the article could be stronger. Once we were preparing for a group discussion about the rise of fascism and they asked me to come by to help photocopy some excerpts from some of their many, many books in their apartment. When I arrived I saw that they had an enormous pile of books with different sections and pages marked and ready on their desk. It came as no surprise to me that Harold had invested so much time into reading and preparing for this group discussion. In years past they’d mentioned that they had considered being a professor in their earlier life. The last time I spoke with Harold was a couple of weeks ago before they went into the hospital. They mentioned that they were going to visit their sister, Dierdre in Winnipeg and asked to meet for a coffee and conversation once they returned home from their long trip. We planned to be in touch once they came back to town. Harold, thank you for your decades of work and devotion. I am so thankful to have worked alongside you.